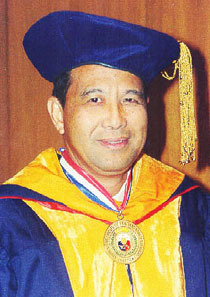 Dr. Emil Q. Javier is recognized for his significant contributions to plant breeding research in rice, maize, sorghum, coconut, abaca, and tropical grasses and legumes and his pioneering and award-winning research and extension work in tropical pastures agronomy and utilization in integrated crop-livestock farming systems. The most outstanding virtue of Dr. Javier as a scientist is his ability to conceive and put into action realistic approaches to the problems that confront tropical agriculture in a developing country. Aware of the small farmer's limited resources, he has always directed his researches toward developing practical methods of improved crop production, using cheap, indigenous inputs. Based on his experiment of introducing legume into native Imperata pastures with minimum or no tillage, a national pasture development program was launched in 1972 premised on the minimun or no tillage establishment of adapted legumes on native pastures with application of phosporous. 2002 - The Outstanding Filipino (TOFIL) Awardee for Science and Technology - Philippine Jaycee Senate and Insular Life Assurance Company, Ltd.